Noida (India) – Primary Packaging plays an important role in the pharma industry, where its purpose ranges beyond providing barrier protection to creating unique brand identity, brand protection and patient communication. The global pharma packaging industry is booming with modernization, courtesy several drivers in the technology innovation segment, with India being the hub of Pharma. 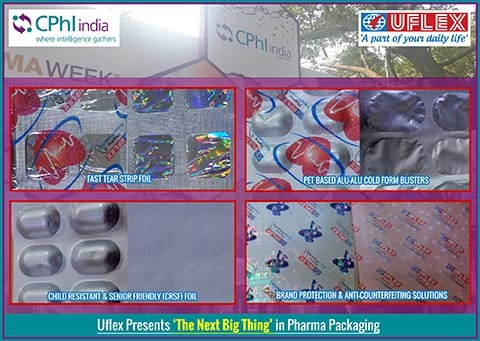 At the recently held CPHI India in Greater Noida, a gathering of Pharma manufacturers and professionals from across the world, Indian flexible packaging giant Uflex steered the path of innovation by unveiling a portfolio of its latest products in pharma packaging- Fast Tear Strip Foil, PET based Cold Form Blister, Child Resistant & Senior Friendly Foil and Branding Solutions- for pharmaceutical companies. Fast Tear Strip Foil: Conventionally, Pharma companies have been using 30 and 40micron soft tempered Strip Foil pack laminate. Uflex has developed 20micron pin-hole free soft tempered foil. It contributes in providing higher yield gain of 36% leading to tremendous cost savings for Pharma companies. Offering excellent printing on matt finish with superior readability through multi-color reverse printing design on Special PET film in Special PET/Foil/PE laminate; Fast Tear Strip Foil is produced in house to impart easy tear-ability of the laminate without any effort. Fast Tear Strip Foil maintains the bursting pressure of the pocket with reduced foil thickness. The value addition of holography solution with Latentogram imparts brand protection of the pack and maintains the same barrier properties when compared to that of conventional strip pack laminate. This foil conforms to all regulatory requirements of pharmaceutical products and also meets toxicology requirements. PET based Cold Form Blister: In the conventional Cold Form Laminate, there are three layers – Nylon, Aluminum and PVC. Uflex has developed revolutionary Alu-Alu packaging where special polyester film has replaced the conventional Nylon and PVC while retaining Aluminum making it an indigenous product since both PVC and BON have to be imported from other countries. For this unique development, Uflex has also been granted a United States Patent recently. Alu-Alu packaging provides sustainability and cost optimization giving it an edge over conventional Alu-Alu packaging. Child Resistant & Senior Friendly (CRSF) Foil: The Child Resistant & Senior Friendly (CRSF) Foils, developed by Uflex, are available in two types Push-Through and Peel-Push. As the name suggests, it requires some amount of pressure for a child to open it. However an adult or senior can open it easily. This protects unintentional damage to the foil which is common with conventional blister foils which get easily tampered during handling affecting the formulation. CRSF Foils are also commonly used in regulated markets. With this product portfolio, Uflex will be able to bridge the gap which is existing currently. Brand Identity and Protection Solutions: Pharma brands face two major problems namely Counterfeiting and Medication Non-Adherence in case of chronic therapies. Considering the literacy levels and linguistic diversity of India, Uflex offers tailor-made Consumer Discernible Packaging Solutions which provides Unique Brand Identity and top-of-mind medication adherence communication along with highly specialized brand protection packaging technologies. By introducing non-duplicable anti-counterfeiting overt and covert technologies, pharma industry stands to gain by checking the challenge of spurious drugs in the market. After the display of these products at CPHI, they have been launched for Indian pharma markets.